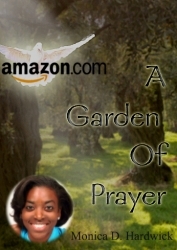 St. Petersburg, Florida entertainment entrepreneur Monica D. Hardwick will release her children’s play; A Garden of Prayer on National Day of Prayer May 1st 2014. Saint Petersburg, FL, April 25, 2014 --(PR.com)-- A Garden of Prayer, a play for children written by Monica D. Hardwick, will be made available globally in multiple languages via Amazon on May 1, 2014. The story, originally written for Bay Area Studios Foundation, is a fun, energetic and memorable way to teach kids how to pray and how to increase their faith. "I kept getting requests from people who wanted a copy emailed to them," said Miss. Hardwick. "After an idea from a family member, I decided that I would make it available for other youth groups to perform as well." Portions of the proceeds benefit the Bay Area Studios Foundation of St. Petersburg, Florida. In a crisis you can do 1 of 3 things: panic, paralyze or pray.